Have you ever wondered how oak barrels are made? When I go to wineries and see rows and rows of oak barrels I can’t help but wonder, “where did they get all this wood from? How did they form them out of wood? Why don’t they leak? There aren’t any nails or glue, how did they get put together?” When you see the video below, you’ll see human ingenuity at its best. A few weeks ago the people at Jordan Winery invited a handful of wine buyers and sommeliers to visit the winery. Yes, we were wined and dined and treated like kings. But with all that, what stood out the most was the trip they set up for us at Tonnellerie Francaise Nadalie in Calistoga. Nadalie has a long history in France for making high quality French barrels. In 1980 they brought French barrel making techniques to Calistoga. Instead of making French oak barrels, they only made American oak barrels in America. They own and run Megnin Mills in Pennsylvania. Megnin Mills provides most of the oak used at Nadalie. It is a serious business! It takes about 200 years for an oak tree to mature enough for barrel making. It is hard to fathom and I still cannot wrap my head around it. 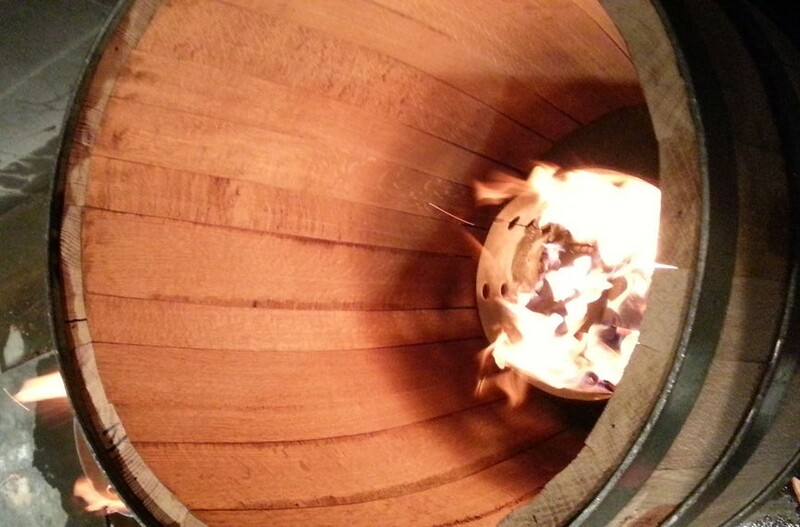 Some wineries will actually pick the specific tree they want for their barrels. Nadalie brings the oak from the mill and process the barrels in Calistoga. The team of workers have been together for years which makes the factory run like clockwork. Their goal is to produce 55 barrels a day. Although Nadalie uses machines to make the oak barrels, there is still a lot of skilled labor and craftsmanship involved. In order to keep the barrel making process moving, each person has to be on point. This is a job that involves a lot of hard labor and repetition. The workers fall into a rhythm and fall into some sort of zen-like state. Their pride in their work is clear and it is that pride that allows for such high quality workmanship. The short video below will take you through the oak barrel making process. I hope you enjoy it. Fascinating! Does Nadalie have sustainability programs and commitments to reduce their environmental impact? Is the wood certified? How does Jordan recycle the barrels? I am not sure about Jordan and Nadalie’s impact on the environment. I do know that Nadalie follows the same regulations as in France, for every tree used one is planted. These are good questions and should probably directed to Nadalie and Jordan for a correct answer. Cheers!